St Gall's won a sixth straight Antrim club title with a 1-11 to 1-5 victory over St John's at Casement Park. CJ McGourty scored a goal and fired over four points to help St Gall's into a 1-7 to 0-2 lead at half-time. Gareth Clarke netted to give St John's hope but they had Niall Ward dismissed late on as St Gall's won with ease. Portaferry recovered from a 0-8 to 0-5 half-time deficit to defeat holders Ballycran 3-8 to 0-12 in the Down SHC final at Ballygalget. Portaferry scored three goals in a nine-minute spell at the start of the second half to gain control. Holders Dromore defeated Killyclogher 2-6 to 0-6 in their Tyrone semi-final replay at Omagh on Friday night and will now play Errigal Ciaran in the final. Mayobridge beat Saval 0-17 to 1-11 and Longstone edged out holders Burren 2-8 to 1-13 in Friday night's Down quarter-finals at Pairc Esler. The two remaining last-eight ties will be at the same venue on Saturday with Bryansford meeting Rostrevor (18:30) and Kilcoo up against Castlewellan (20:00). 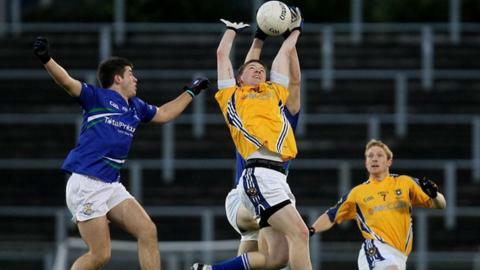 Sunday also sees the Cavan Football Final between Kingscourt and Mullahoran at Breffni Park (13:45).